PrevPreviousWe’re Moving to the Lake! So, it’s August. How are you doing with your goals? 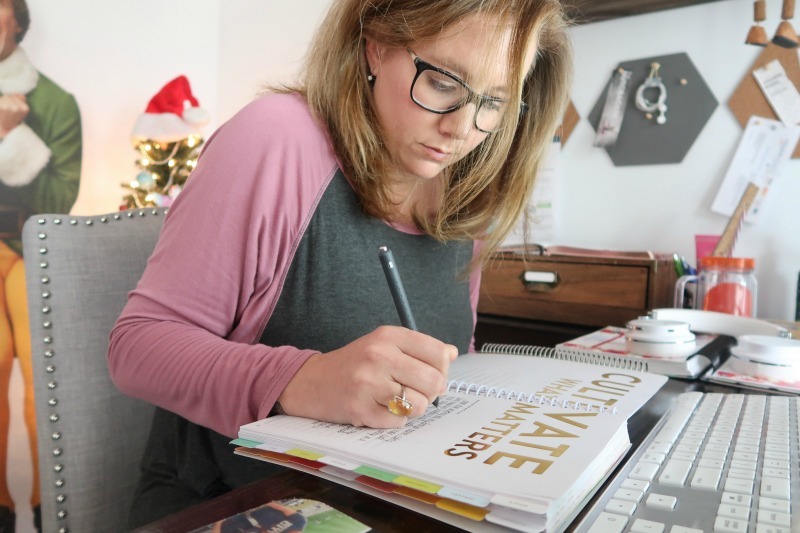 Let me guess…you’re having this inner dialogue right now that goes something like this: “Oh yea….I set goals about 8 months ago and kind of…wait, what happened to that piece of paper I scribbled them on? Ugh. I’ll just wait until January.” Ok listen, we’re not waiting on January. We’re getting back on track with goal-setting TODAY. However, sometimes life throws us off track. Sometimes our goals and the progress we’ve made gets derailed. Sometimes, we just give up. Prime example: We have spent all of June and July looking at houses then finding a house then moving into the new house and listing our old house, and on of our dogs had emergency surgery, and ugh. Life, am I right? Give up on my goals altogether and wait until January 1st to start over. Scoop up my goals from May and try to remember where I was and if they are still relevant. Ding ding ding!! Door #3 for the win, please, Alex! There is nothing magical about January 1st. When life throws you a curveball, and you lose site of your goals, you need to get back on track today, right now – not tomorrow, not next month, not on a Monday because it just makes sense, and definitely not January 1st! This post contains affiliate links where noted with an asterik (*). #1: Find a system that works for you. I use and love PowerSheets*, but a sheet of paper with clearly defined goals works well, too. 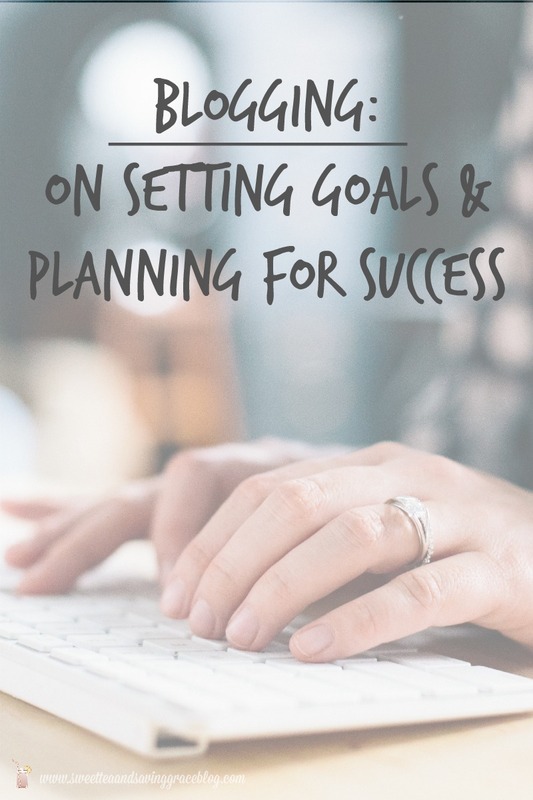 Find a goal-setting system that works for you, but make sure it’s not just arbitrary goals written down. I love PowerSheets* for a whole host of reasons. 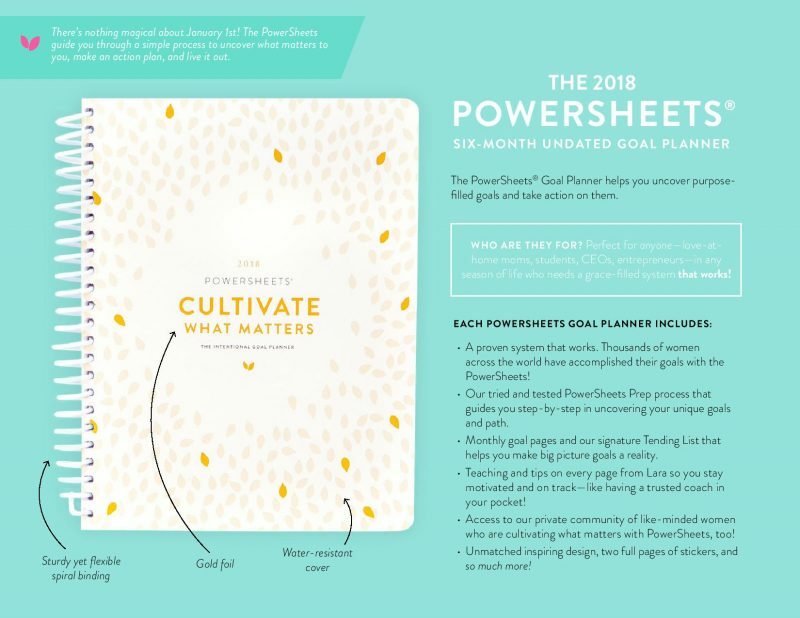 They’re pretty, but they’re super functional, and do more than just give you a space to write out your goals. Your WHY: Why are these your goals? Why is it important to you to accomplish them? The steps you’ll take to achieve these goals: What is the first thing you need to do to make forward progress? Break each goal down into action plans. Deadlines: Goals without deadlines are just dreams. Set a deadline and stick to it. If life happens and you get off track, come back to this post, wash, rinse, repeat, and ACHIEVE! Your wins: Big or small, celebrate ’em all! You have to celebrate even the baby steps because it’s a step in the right direction and helps you keep your momentum. 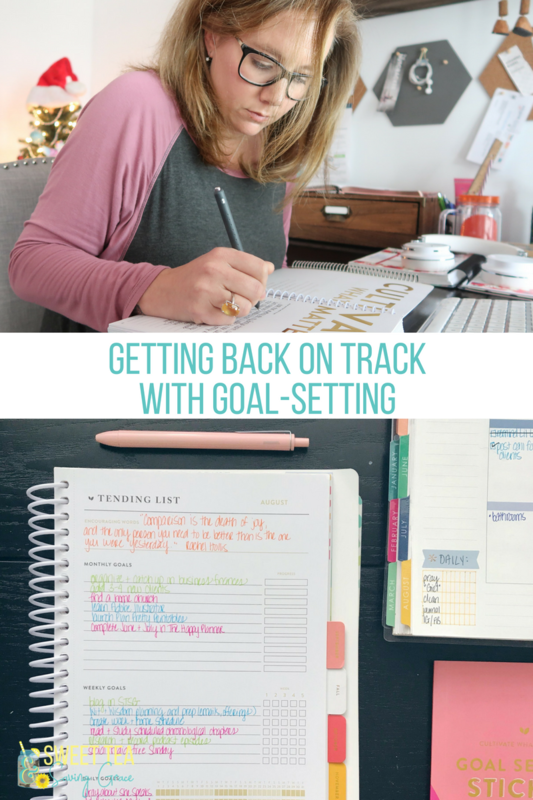 I recommend resetting your goals quarterly, but it’s especially vital when you’ve gotten off track and need to give your goals a jumpstart. Look back at the goals you set at the beginning of the year and determine if they are still things you want to accomplish, if you’ve already accomplished some of them, if they are still relevant to your life or important to you, and if there are new things you’d like to work towards. Life happens, and changes in your life will greatly impact the things you think are important and worth chasing, which means your goals will change as you grow. Don’t be afraid to throw out all of your goals if you need to and start completely fresh! This is so vital, my friend. 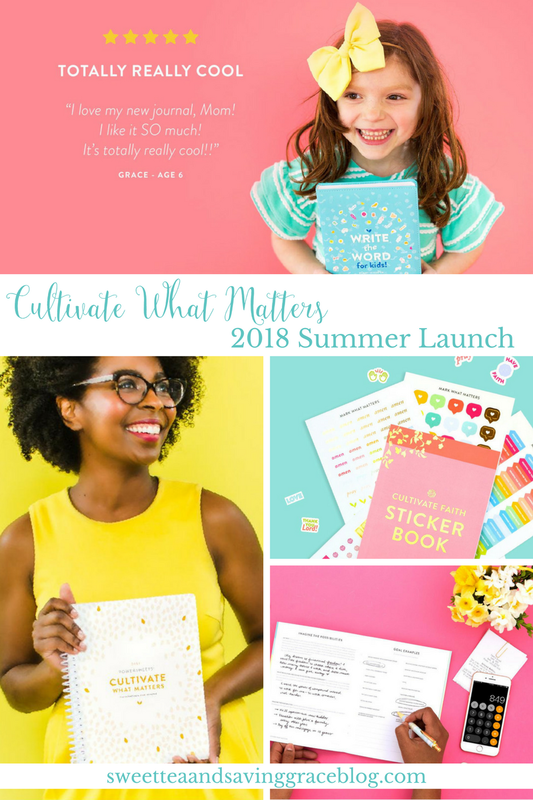 If you’re reading this on your phone while packing the kid’s lunches and looking for your other black high-heeled shoe wishing you could reset your goals right now, DON’T. Now is not the time. Look at your calendar and carve out some time – an hour, an afternoon, whatever. Shut out all distractions – kids, spouse, work, social media, phone notifications. Then reflect on the year you’ve had so far, the goals you set, and the progress you’ve made. Spend time brainstorming, journaling, meditating, praying – whatever it takes to recenter yourself and discover what is truly important to you and the goals you want to work on over the next few months. Quick Tip: Make this dedicated reflection time a regular thing to help maintain your sanity and keep yourself in check. Remember what I said earlier? Goals without deadlines are just dreams. After you’ve set your goals, grab your pen and calendar, or open your calendar app, and add those deadlines into your calendar IN INK! Go one step further and add in each baby step to your calendar, too. If you need to take a class to help you accomplish a goal, look up the registration dates and class dates and put those in your planner. Goals don’t happen overnight. You have to chip away at them little by little to make them become a reality. Deadlines are the difference between goal-setting and goal-GETTING. I think one reason so many people fall off the wagon with their goals in about mid-February is because they set huge goals that take a long time to accomplish, and they feel unrealistic and unattainable. It’s August (at the time of writing this), so for now, focus only on the last five months of the year. What can you realistically accomplish in the next five months? If you want to think bigger picture, fine, but break down those big goals into smaller goals that you can work on over the next five months. Don’t go so far ahead in your goal-setting that you burn yourself out with trying. You need those small wins to keep yourself moving forward. Friends, coworkers, Facebook group members, Instagram followers – they can all help you be accountable to your goals. You can help each other! Be honest and own up to the fact that you let your goals slide a bit, but you’re ready to get back on track. Find people who are in the same situation and be each other’s accountability partners. Check in with each other once a week or whenever it works for you and share your progress, help each other overcome setbacks or hurdles, and celebrate those successes (big or small!) with each other! We all need at least one person to believe in us. Be that one person to someone, and let them be that one person for you.